No, the polar bear isn’t starving, quite the opposite. Look closer and you will see a breeding seabird colony that has been completely destroyed. This bear is part of a growing population at Nordenskiöldkysten, Svalbard that are swapping seal hunts for seabird eggs. Their intake rates top out at 100 eggs/hr and the bears switch to the chicks if any eggs do survive to hatch. The bears are arriving earlier to the site every year, a sign that they are sussing out the optimal time to predate on fresh eggs. Last year (2014) no chicks or eggs of any of the three species that nest at Nordenskiöldkysten (barnacle geese, eiders, and glaucous gulls) survived. This diet switch is a response to the increasingly early break up of sea ice, a platform polar bears need to hunt seals. The researchers of this relatively new study were faced with a dilemma when polar bears began to feature in their long-term barnacle geese monitoring project, but made the heartbreaking decision many wildlife biologists do to let nature take its course. The next few years will determine what will happen to this local seabird population, will they move breeding sites or will their ubiety forsake them? 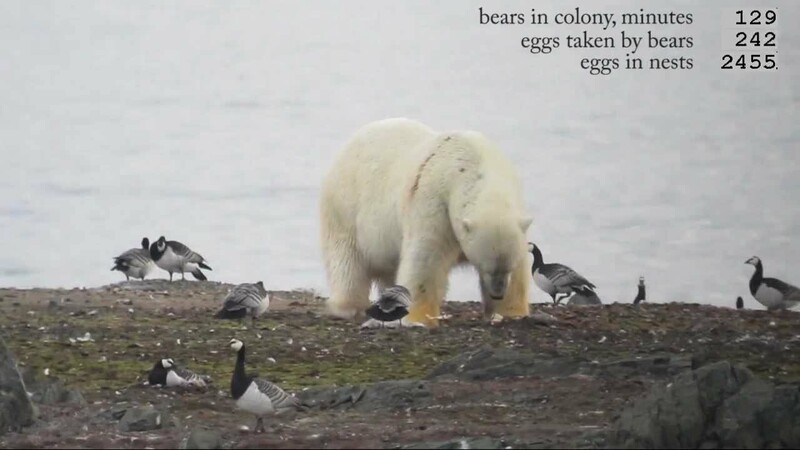 Monitored seabirds colonies in the Canadian Arctic have also directly observed polar bears at the colony or evidence of their presence (i.e. poop full of shells), too. Both seabirds and polar bears are declining rapidly and have highly passionate conservation groups/activists behind them. This is only the first, certainly not the last, of these conservation clashes. What is the answer?